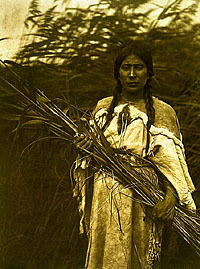 Because of bad harvests and conflicts with the tribe of Mandans, they were obliged to join the Pawnees in Nebraska. But the danger represented by Sioux and the « Whites » forced them to migrate again along the Missouri river. Several epidemics of smallpox stroke them hard, in particular in 1836 and in 1837, then in 1856. Weakened by the disease and submitted again to the Sioux attacks, the tribe was reduced by half. In 1862, after wandering, Sahnishs joined the tribes of Mandans and Hidatsas, within the Mandan Nation, Hidatsa and Arikara, in a village named “Like-A-Fishhook” where they are still living today. Their population is at present slightly superior to 3 000.